This post is part of a series called Itineraries. In this series I’ll document the itinerary which we used when visiting a country in summary. I realized I needed to add this information to help my friends and family who read my blog when planning their travels. Enjoy! We entered Vietnam over land from Xam Neua, Laos. The border crossing was uneventful. The bus ride was miserable. I don’t recommend this route to anyone – unless you’re going out of your way to get off the beaten track and want to haggle over pennies with bus drivers that stop for drinks and suspect-looking pipes in every village. In Hanoi we stayed at the Rendevous Hostel – booked via Hostelworld.com – which we loved ($40/night in a four-person dorm). The location in central old Hanoi is perfect for anyone with limited time in the city who wants to be in the thick of things every moment. 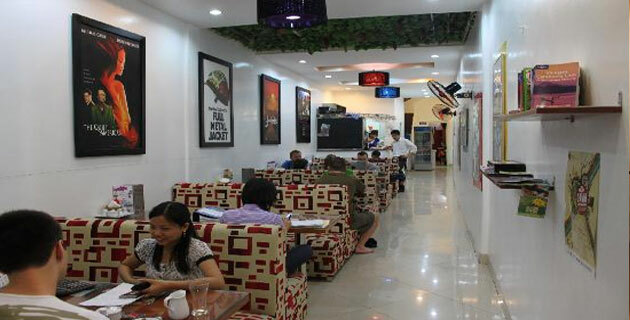 We loved the hand-painted versions of Vietnam-themed movie posters in the restaurant. In our three days in Hanoi we walked all over the old city, visited the “Hanoi Hilton” prison and did a 1-day tour including visiting the Ho Chi Minh memorial and various other city sites. The high point for this family of geeks on tour? we passed an apartment block called the “Hanoi Towers”. Photos were taken. We did not attempt the puzzle with these buildings. 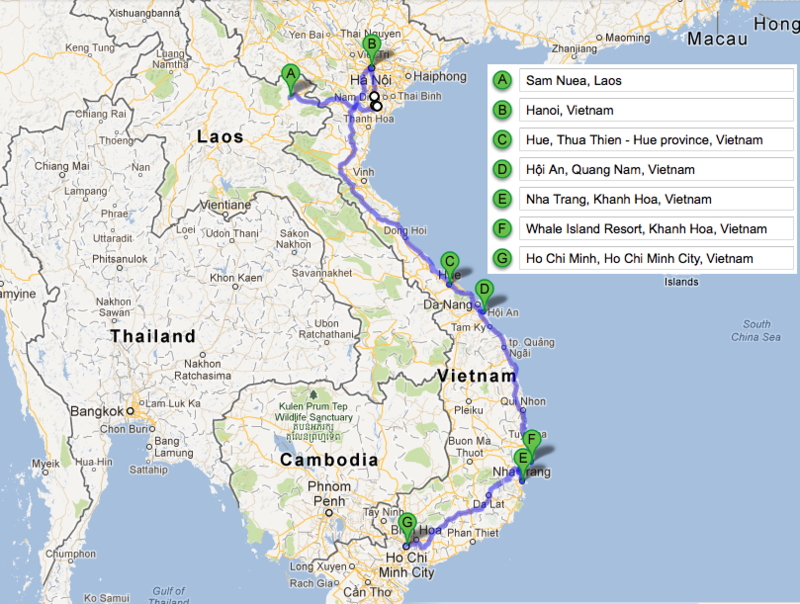 We took an overnight train from Hanoi to Hue. Our bunks were in a four-person compartment like on an older European train. Trains do book out quickly so if you plan to take a train in Vietnam this is something you may want to book ahead of time or at least as soon as you arrive. In Hue we stayed at the microscopic but charming Hue Nino Hotel which is on the north side of the main tourist area and across the river from the historical sights. This time we had one double room and one twin for $20 per room per night. The staff here was so lovely and tremendously friendly and welcoming so we picked them up some flowers at a local flower market just to say thanks. I think the flowers ended up costing more than our total hotel bill. In our wanders around Hue we spent almost a whole day at the Imperial Citadel, a beautiful site, which is an important reminder that Vietnamese history did not start with the Vietnam War. We took an early morning bus from Hue to the impossibly pretty Hoi An. If I could go back to Vietnam tomorrow I would plan to spend at least a couple of days in this picturesque little town. Sadly we had a brief four hours, just enough time for a quick walk around and lunch and then it was time to catch our overnight bus to Nha Trang. If at all possible, avoid overnight buses in Vietnam. The sleeper seats are made for people 5′ and shorter. Thankfully we were able to catch up on sleep on the beach in Nha Trang. Our primary reason for stopping Nha Trang was to scuba dive. CAM and BigB took a certification course with Rainbow Divers. 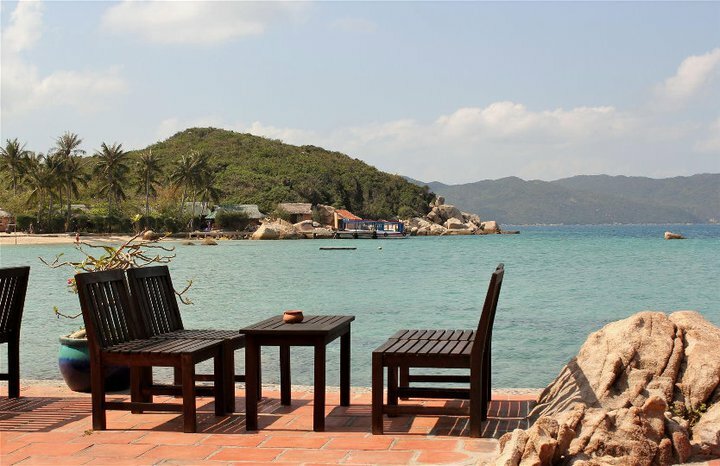 However after three nights at party central aka Backpackers House ($30/night total) we gave up and moved to Whale Island resort – a perfect island retreat just north of Nha Trang. The full board price came in at $140/night which was a steal for the quality of food served. Having learned our lesson on our overnight bus from Hue, we took the train to Ho Chi Minh City where we celebrated the half-way point of our year-long trip. On a whim we stopped by the Mekong Bike Tours offices in HCMC and found that they had spots open on a three-day cycling tour of the Mekong delta leaving the next day. This being the very kind of serendipitous event that we love when we travel, we signed up. The homestay accommodation on the delta was spotty but the overall experience was worth the effort, even if we did get stuck in a rain storm where the water rose to three feet in the streets over an hour only to recede just as quickly. And just like that we were out of time in Vietnam. The next morning we caught a bus from central Ho Chi Minh to Phnom Penh. This entry was posted in Vietnam and tagged Itineraries, Vietnam on January 3, 2013 by wandermom. BigB climbing into the Chu Chi Tunnels outside Ho Chi Minh City (Saigon), Vietnam. 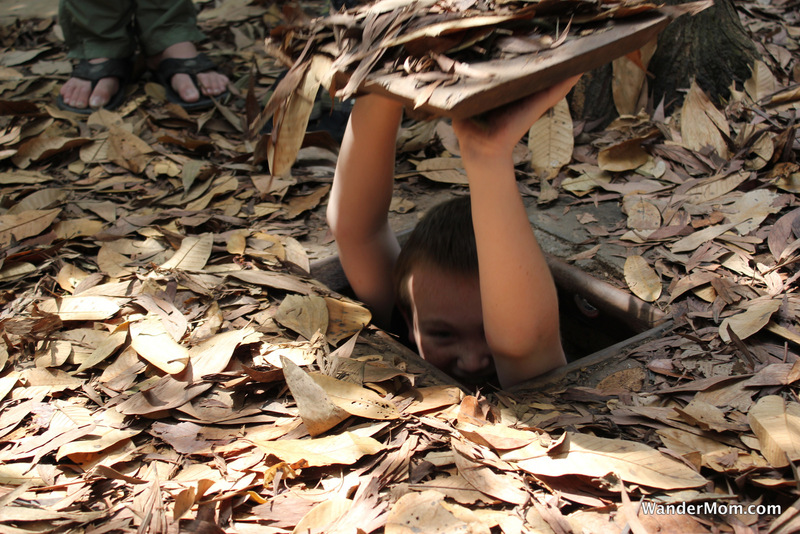 These tunnels were a vital part of the Viet Cong’s strategy during the Vietnam War. And just about disappearing into the tunnel. 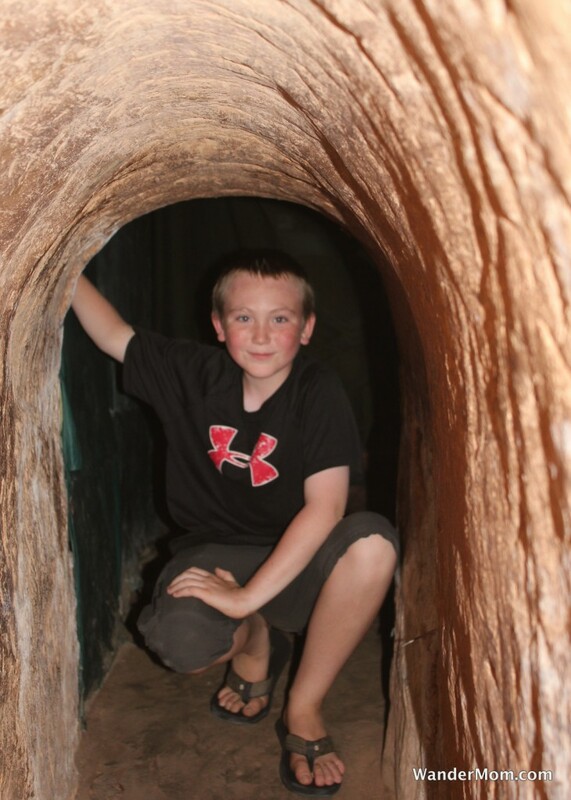 Inside the tunnels showing how small these spaces are – even for a 10-year-old boy who stands at about 5′ tall. 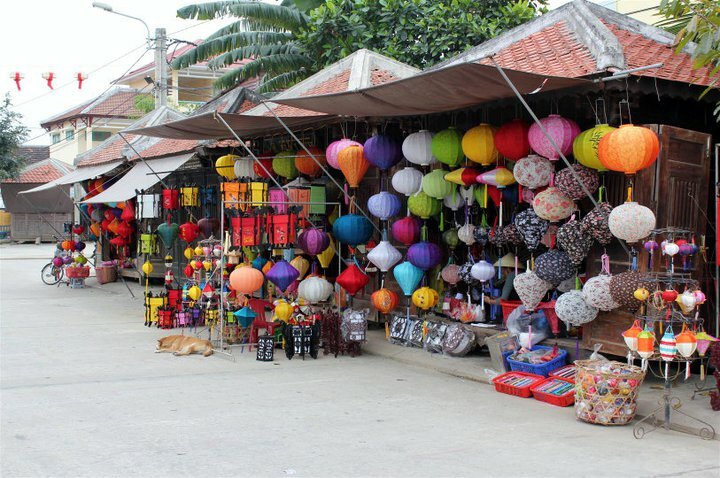 This entry was posted in Vietnam and tagged Ho Chi Minh City, Photo Friday, Saigon, Vietnam on April 6, 2012 by wandermom. 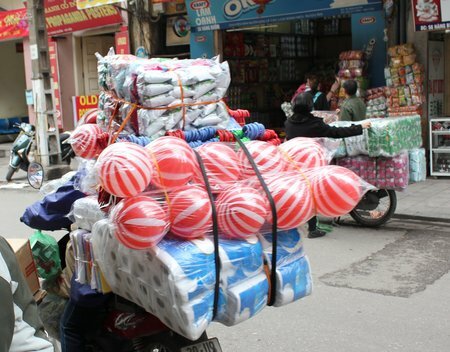 This entry was posted in Vietnam and tagged Hanoi, Photo Friday, Vietnam on February 10, 2012 by wandermom. Just inside the square of the main palace at the Citadel or Imperial City in Hue, Vietnam, there are a pair of massive bronze urns filled with rain water. 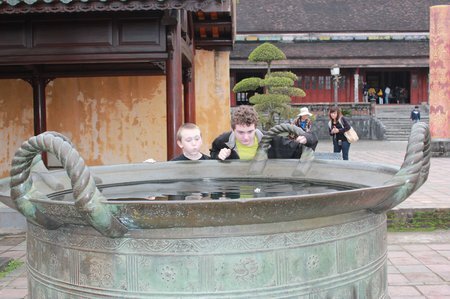 Unsurprisingly, as with fountains and other such water features in any city, people throw loose change into the urns for good luck. When CAM peeked into one of the urns, he spotted an origami crane, now sunken, among the coins. 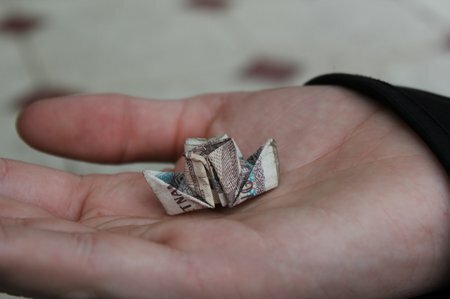 Being an origami nut himself, he though this was a capital idea. Since we didn’t have any origami paper on us (! ), he settled for a Dong note instead. Setting the boat afloat on the urn “pond”. 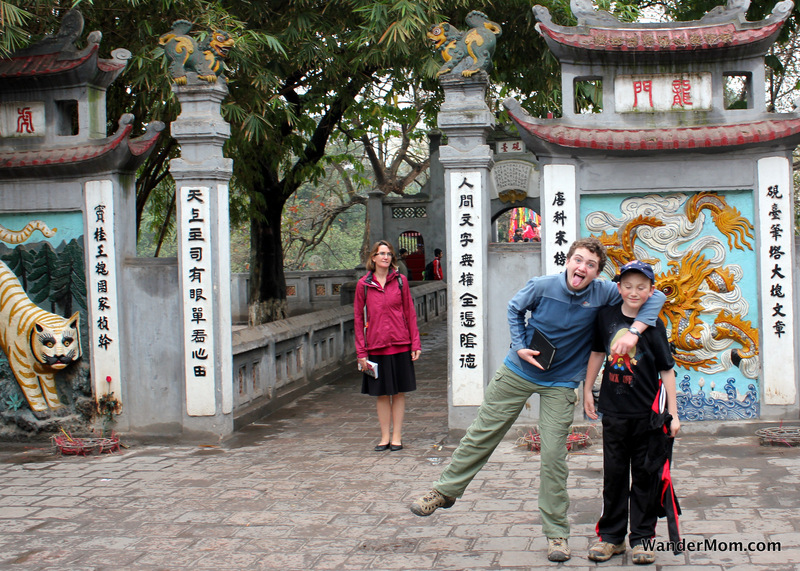 This entry was posted in Kid Travel Photos, Vietnam and tagged Citadel Vietnam, family world trip, Hue, Imperial City Vietnam, Vietnam, Vietnam With Kids on March 31, 2011 by wandermom. 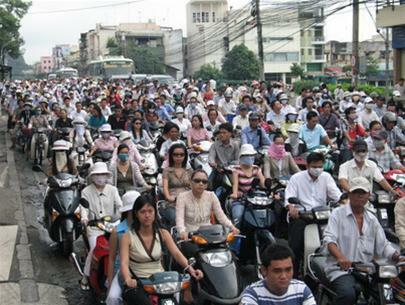 The web abounds with photos of swarms of motorscooters in cities all over the world particularly in South-East Asia. It truly is a change of pace than in European and American cities. I find the motorscooters piled with freight most fascinating, good enough, certainly for a Top 5 post. 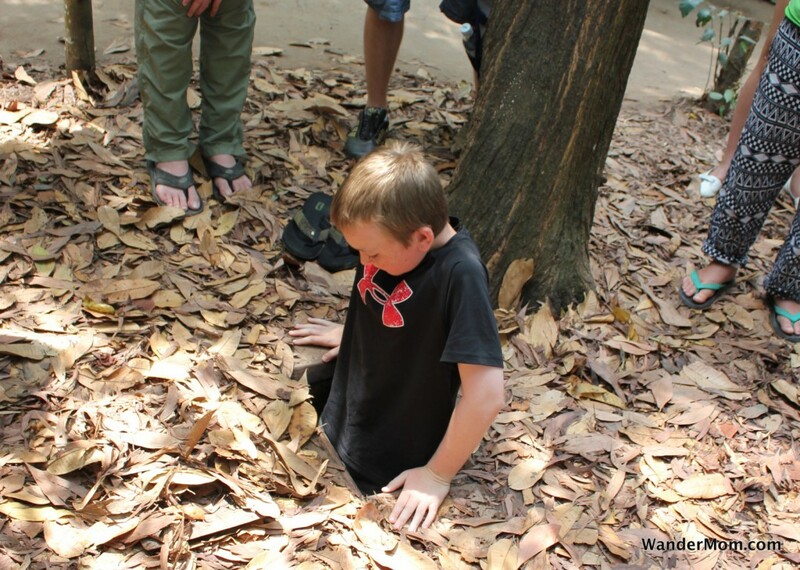 This entry was posted in International Escapades, Vietnam and tagged Motorscooters, Vietnam, Vietnam With Kids on March 22, 2011 by wandermom. Over the past three weeks I’ve totally fallen off the blogging wagon. It turns out that when I schedule busy sightseeing days and sporting activities with the express purpose of wearing out my children, I end up face-planted on my pillow with no energy left either. Well duh! 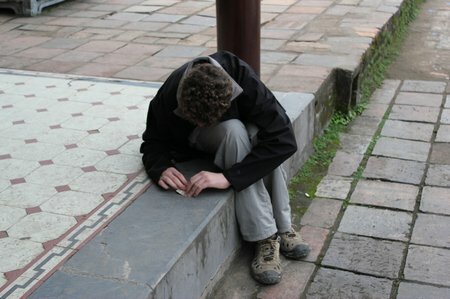 This entry was posted in International Escapades, Vietnam and tagged Saigon, Vietnam on March 7, 2011 by wandermom. I once broke the front windscreen of a Peugot 205 with my head. It was late, I was coming home from the college library. Foolishly, I decided to cross the road from between parked cars. I never even saw the car that hit me coming. 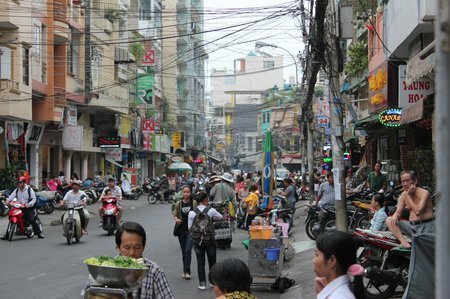 This entry was posted in International Escapades, Vietnam and tagged Hanoi, Hanoi Traffic, Vietnam on February 16, 2011 by wandermom.